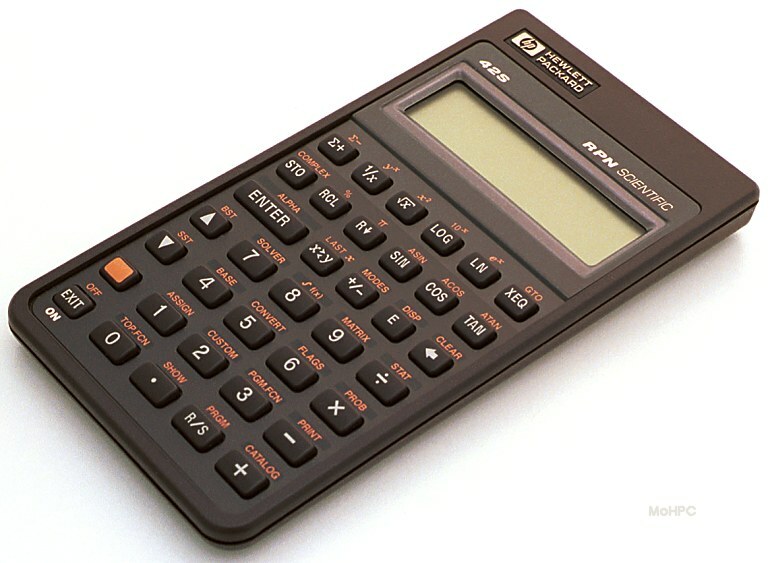 This small but powerful calculator was designed to be software compatible with the HP-41C. It lacked the HP-41C's expandability but it offered, a two line dot matrix screen with customizable menus, greater speed, smaller size, and a lower price as compensation. Basic scientific functions including hyperbolics. A beeper which optionally sounded on errors or under program control. Binary, octal, decimal and hexadecimal bases with integer arithmetic and logic functions. 7.2K Bytes of user memory. Variables were more powerful than registers because they could hold complex numbers and matrices. (However, the registers were really just a matrix named REGS so the user could make all the storage registers complex.) 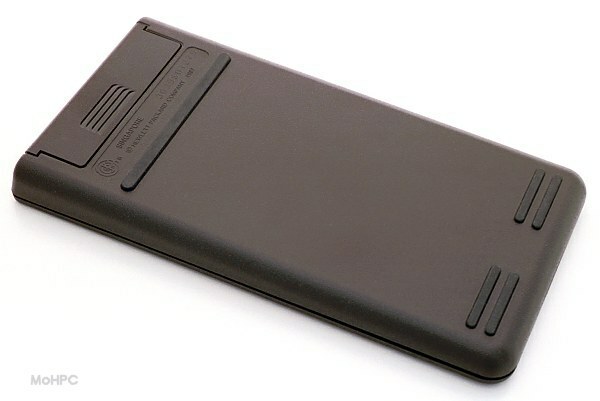 Strings were still limited to 6 characters as on the HP-41C when stored on the stack, in a register or a variable. Strings of up to 44 characters were allowed in the Alpha register. The calculator had a sophisticated menu system. Multiple line menus could be traversed by using the up/down keys. Mode settings were indicated by a square dot. Menus could lead to submenus and where most Pioneers had a clear key, this model had an EXIT key to return to the previous menu. 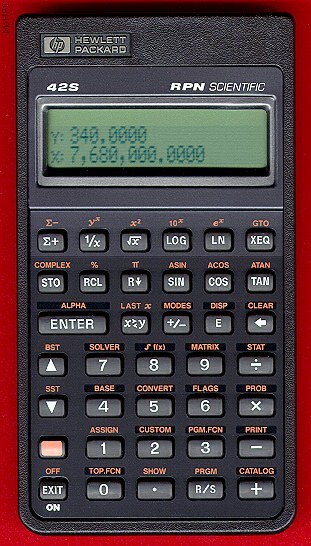 Like several earlier Pioneers, the HP-42S allowed alpha data to be entered via an alpha menu. Characters could be typed into the Alpha register, used to specify a variable name or a program label or entered as program instructions. The Alpha register held up to 44 characters. ASTO and ARCL was used to move data between the alpha register and other registers and variables. Complex numbers were integrated into the calculator such that they appeared naturally when required (for example the square root of a negative number.) Each complex number required a single stack element or variable and was display like X iY. To enter a complex number, two real numbers were entered and COMPLEX was pressed to convert them to a single complex number. A new feature on this model allowed both polar and rectangular forms of complex numbers. Matrices could be stored on the stack or in variables. A new Matrix could be created in the X register by entering its dimensions on the stack and pressing MATRIX NEW. This left [ YxX Matrix ] displayed in the X register. To enter values, the user pressed the EDIT key and then used the arrow keys and GOTO to move about and pressed EXIT when finished. 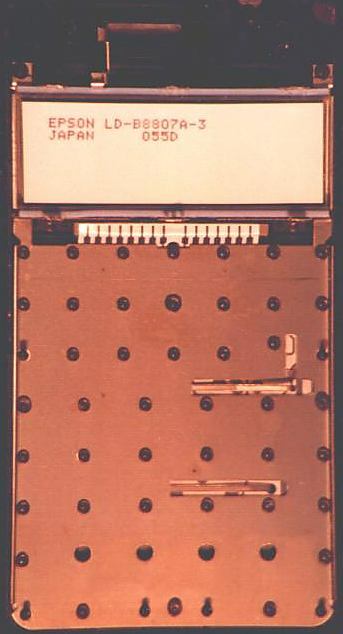 Internal picture showing PCB attached to keyboard attached to front of calculator (~53K) Note CPU held in place by plastic backbone. Batteries and IR transmitter are at the top. Image by Paul Brogger. 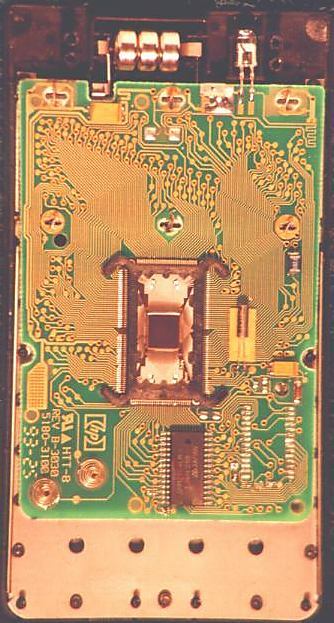 Internal picture (PCB removed) showing back of keyboard and LCD (~28K) Image by Paul Brogger. 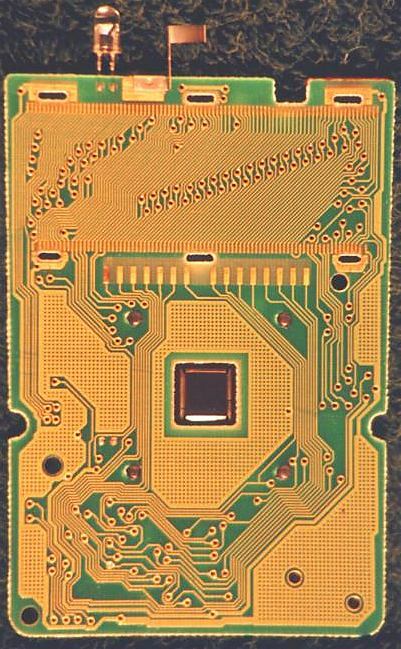 Internal picture showing other side of PCB with the CPU visible through the center hole (~74K) Image by Paul Brogger.